What is an Osteochondral defect ? Osteochondral defects (OCDs) are very localised areas of joint damage which can occur in a number of different joints , not just the ankle. The “classical” defect involves a disruption of both the bone (osteo) and cartilage (chondral) .They usually occur on the Talus if effecting the ankle joint and are a region where the cartilage and underlying bone have been disrupted. How disrupted can vary from ‘bruising’ which may recover spontaneously to a deep defect on the surface of the joint extending well beneath the articular surface. These most often, though not exclusively, occur after some injury to the joint. A not uncommon history is that of a sprained ankle which has failed to settle and gives symptoms (generally pain plus or minus instability) long after it should have settled (see ‘The sprained ankle’ section for a more comprehensive review of ankle sprains and instability). On occasion these defects can occur spontaneously also. Sometimes they can be seen using plain X-rays but more often an MRI or CT scan is required to reveal the diagnosis and quantify the size of the defect . How is an Osteochondral defect different from ankle arthritis? The changes in the joint surface are very localised with an Osteochondral defect whereas they are more widespread in arthritis (though both effect the cartilage and bone layers of a joint). With an osteochondral defect the pathology is almost always just on the Talar side of the joint whereas arthritis usually effects both sides of the joint. In most cases an Osteochondral defect does not progress and deteriorate whereas as the opposite can be said of arthritis in many cases. What symptoms might I have & should a defect always be treated? A decision to have treatment can be made on the basis of whether the patient has persisting and troublesome symptoms or not. Symptoms are not all or nothing though and a person may go through good and bad patches. It is worth bearing in mind that there is some evidence that surgical treatment of an osteochondral defect is more successful if performed within the first 12 -18 months after onset. What treatments are available for an osteochondral defect ? A defect with minimal cartilage and bone changes ,if detected early, may settle with conservative treatment using a plaster cast or post-operative boot and restriction of activities. This may need to be worn for one to four months. The chance of success is in the region of 40 to 50 % and the situation where this sort of defect is picked up at an early stage is unusual. An injection of local anaesthetic and steroid into the joint can also assist the reduction of symptoms (due to secondary joint inflammation) but will not effect the underlying condition. Operative treatment is more successful but requires fairly prolonged periods of restricted weight-bearing post surgery. The first line operation in many cases is simply debriding the defect with minimally invasive surgery ( known as an arthroscopic debridement and microfracture). The chance of this sort of operation working is in the region of 85%. Weight bearing in a post-operative boot can commence at 5 or 6 weeks and more normal shoewear be returned to by 12 weeks. Running would not be common before 4 to 6 months post surgery. Cylinders of cartilage and bone can also be taken from non-weight bearing areas of other joints (the knee most commonly) and implanted into the area of the defect (this is know as osteochondral grafting). This picture shows the talar defect prepared ready to accept the plug of bone and cartilage. The recovery following this is similar to that following microfracture and the success rate broadly similar. 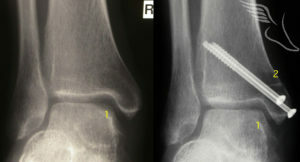 It is normally held in reserve for those cases in whom microfracture does not work as it is more invasive , requiring one of the ankle bones to be surgically broken to gain adequate access to the joint(known as an osteotomy) as well as graft to be taken from a healthy joint (the knee) which can on occasion be painful afterward. Such a case is show below. 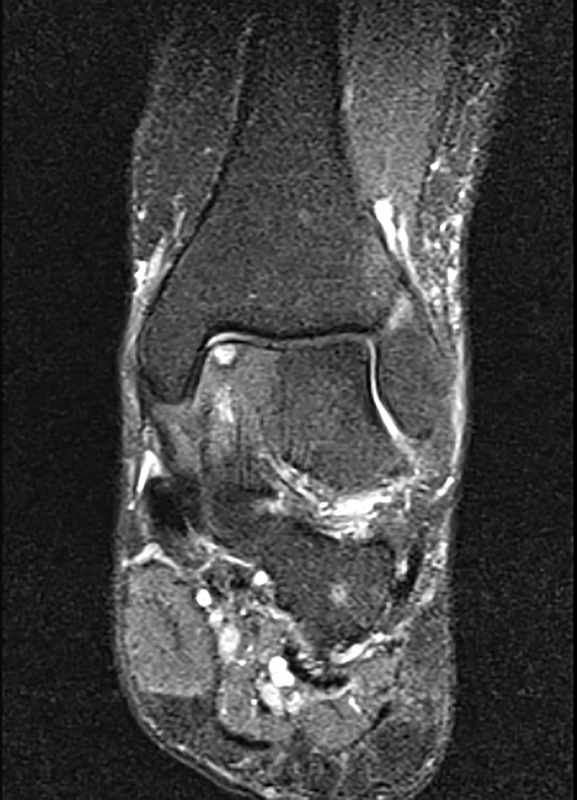 Other newer techniques also have merit in certain cases such as using engineered compounds with similar properties to cartilage to resurface the joint lining (though longevity is a potential issue with such substances).There are also less commonly operations such as implanting sections of allograft (donated talar bone) to deal with very large defects.